Suddenly blizzard started and we didn’t know what to do. Our guide advised us – “be calm” but we were really worried. After a few hours of the storm, our clothes were completely wet while we were standing at a place surrounded by snow. 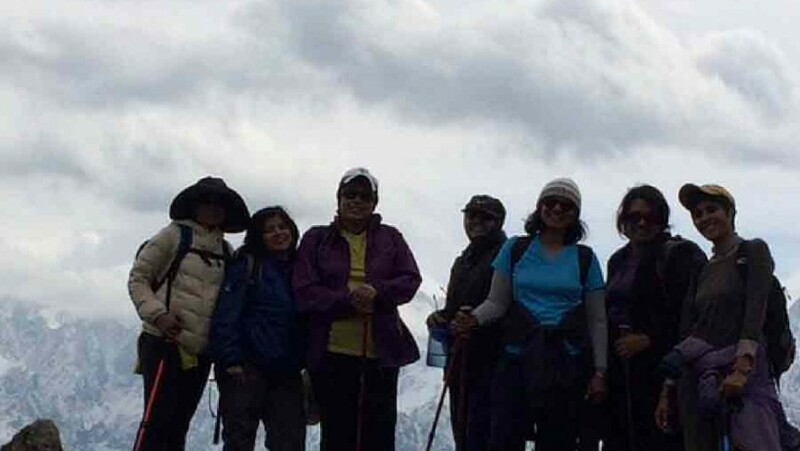 As Saritha Vikraman, a 35+ corporate employee and a mother of 9 months old recollected her Kuari Pass – Himalaya trek experience, she had mixed feelings in her voice. It is one among some thousands of inspirational quotes you may read on Facebook, Twitter, Pinterest or Reddit. But, for Saritha, a mother and a corporate employee, it is more than a quote. In her own words, it is her life. Ask her why and she may reply with a smile “ I had my own dreams- To travel and explore a new destination, consciously find time for myself within the busy work schedule.” She just did that. Saritha, along with her 7 friends took a trip to Kuari Pass in Uttarakhand just nine months after her delivery. And what happened next is history. SelfRoadiez had a brief chat with Saritha, wherein she shared her experiences about the dream journey, what it takes to achieve it and much more. Here are the excerpts. It was during one of my friends’ birthday party that this discussion started. My friend who was turning 40 was keen on our group – all 7 friends undertaking a trek.I was a little skeptical as my child was too small. Then how did you overcome the fear and decided to take a chance? The Himalayas was always a dream for me. I didn’t know how it will materialize with such a small kid. But, all thanks to my family who supported my dream. Now, tell us about how you went about planning? Honestly, I didn’t plan almost two months before the trip. But once the trip date was nearing, I become a lot more focused. It must have been one hell of a task to get back into shape and get fit for the trek? (Laughs). Of course, it was difficult, but at the same time, I just wanted to do that trip. So nothing came in between. What were your initial preparations? The first task at hand was to get in shape. For that, I had to do a lot of exercising. Jogging, climbing stairs of my apartment complex etc were the initial exercises. Later, I purchased trekking shoes and started going for long walks. Also, light cardio exercises for building stamina helped on the trek. And then the D-day came? Yes… We were very excited. Kuari Pass trek is not as simple as you read. A large part of Kuari Pass trek is on high altitude which means more than 10,000 feet high above sea level. It needs a lot of mental strength to climb. We first took a flight to Delhi from Bangalore. From there, the tour operator had arranged for transport to base camp Ghat. Now, tell us about the journey. We started from Delhi early morning by train and reached Haridwar. Our overnight stay was arranged at Joshimath since the trek originated from there. The journey was extremely enchanting as it was through the banks of Alaknanda river. Could you recollect any memories that were close to your heart? There were many. It was a memorable experience traveling through the many winding roads and meandering streams. Few of my friends did river rafting at Atali Ganga camp on the second day of our trip. It was beautiful to watch the nature at it’s very best from such height. Another experience worth mentioning was while driving from Joshimath to Auli, we saw a breathtaking view of the confluence of 2 rivers Alaknanda and Bhagirathi right in front of us. We couldn’t have asked for more. Am sure there would be some bizarre experiences as well? The most bizarre experience happened on the fourth day of our trek. We had reached Auli and were trekking to Gorson. It was then the blizzard started. At that point, we were at some 3,500m above sea level. Our clothes and bag got wet. We couldn’t even move an inch. It was really a nightmare. How did you cope with the blizzard? Oh! That was really scary. All of us were scared but without showing the fear we bravely moved on to reach the camp. Finally, when we reached camp we had a sense of achievement and everybody’s eyes were filled with tears of happiness. Please tell us about Himalayas – the first glance. I had only read about the Himalayas during my school days. But seeing it, though only a smaller part, was the best thing about our trip. We traveled thousands of kilometers to see this natural wonder. It is beyond words. But it was really a team spirit, isn’t it? Absolutely yes. It wouldn’t have happened if our group of friends had not planned it compulsorily. We are going to trek the Himalayas, no matter what’ was our mantra. Do you think it gets difficult for people as they grow in age to go for trekking on the Himalayas? Absolutely no. If you really want it, you can make it happen. We, seven friends, are the example of it. Most of us in the team are 35+ and have a family out there. In fact, 2 of my friends came from Singapore to join us on this trek. Tell us about your family and their support. My child was nine months old when I decided to do this trek. My husband along with my mother’s support managed to take care of our baby. What do you have to tell those people who are passionate about traveling? If you have the dream and passion, just do it. Marriage, kids, job or anything else shouldn’t be a deterrent to that. If you want it, go… and then chase your dreams. The meaning of the word Kuari is ‘doorway’ and is located in the Garhwal region of Northern India. It is at a height of 10003 ft above sea level. It also borders south of Tibet and on the western rim of Nanda Devi sanctuary biosphere reserve. February end and March beginning is the best time to do trek. The trek to Kuari passes through Auli which is one of the popular ski destinations in India.